Halloween themed Impression Obsession clear stamps featuring jack-o-lanterns, bats, spiders, scarecrows, and the sentiments "I'm bats about you", "if you got it haunt it", "happy Halloween", and "eeeeek". This is a clear photopolymer stamp set measuring 4 x 6 inches. Our clear stamps are made in the USA from the highest quality photopolymer. 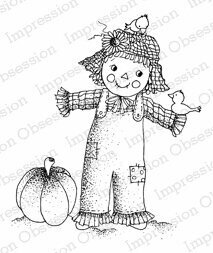 Autumn themed Cling Stamp from Impression Obsession featuring a scarecrow and a pumpkin.